I got a few Kraftwerk albums from a second hand market,much later than the release years, so , for me, 84 was the Kraftwerk year too. 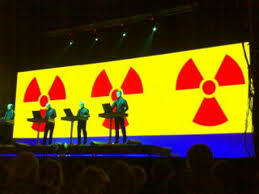 Radioactivity is one of the greatest hits and we must not forget the meaning of the story behind it. The Tsar bomb was detonated two miles above the ground and the shockwave circled the Earth three times, breaking windows in Finland. The mushroom went 60 kilometers high and the flash of light was seen 2000 kilometers around.